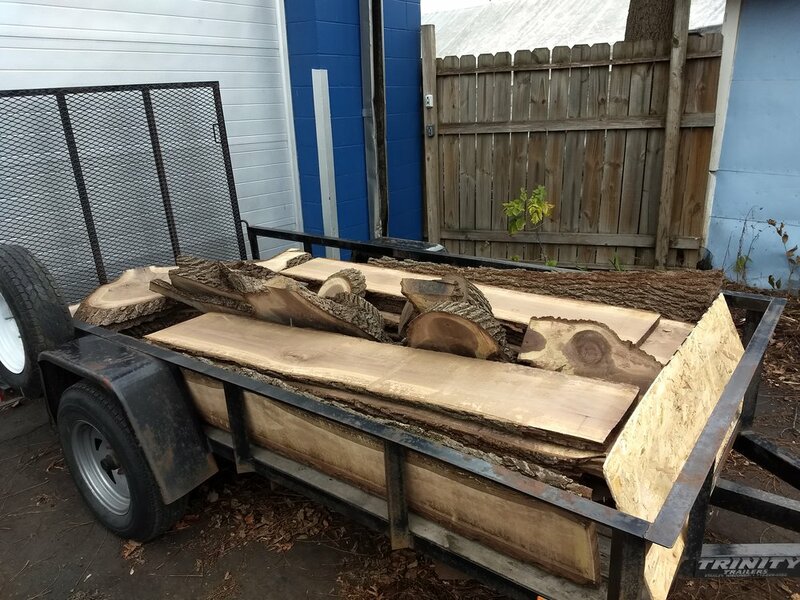 Follow the process of a dining room table being built from a walnut tree that was cut down in the customer's yard. A walnut tree was cut down because it was too close to the customer's house. Two 6' X 16" logs and a very interesting crotch piece where many of the branches clustered from resulted. What a better use for this beautiful wood than to turn it into a dining table for the house the tree originally shaded. First step was winching the logs and crotch onto a trailer. 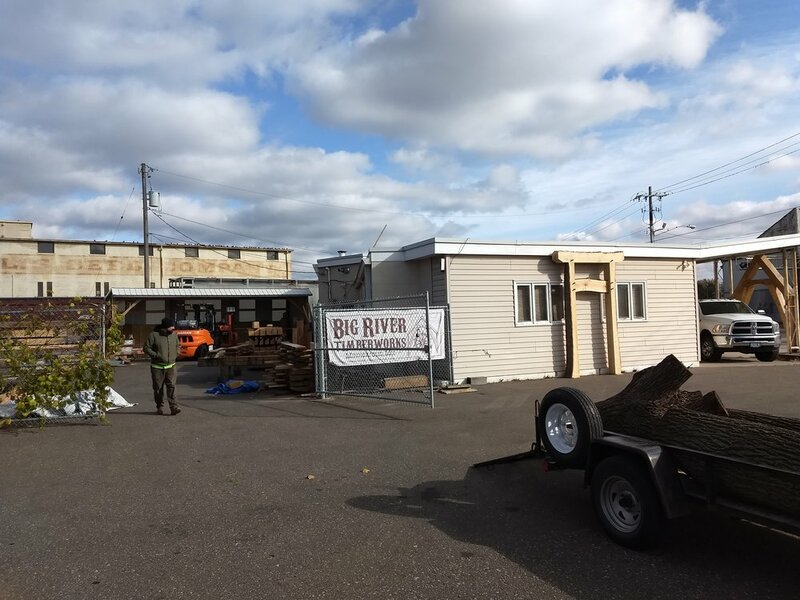 The logs were hauled to Big River Timberworks, a Minneapolis timber frame builder that offers sawyer services on their Wood-Mizer saw mill. Big River's Wood-Mizer is a 25 hp gas powered bandsaw with a 3' cutting width capacity. The logs were forklifted onto the saw and clamped in place. The bandsaw travels down the rails slicing the log. The crotch has some very interesting grain patterns given the confluence of all the branches. This was the most difficult piece to cut as it was hard to place and secure on the saw. The sliced boards were loaded on the trailed and hauled to my workshop where they will be air-dried for 9-14 months. 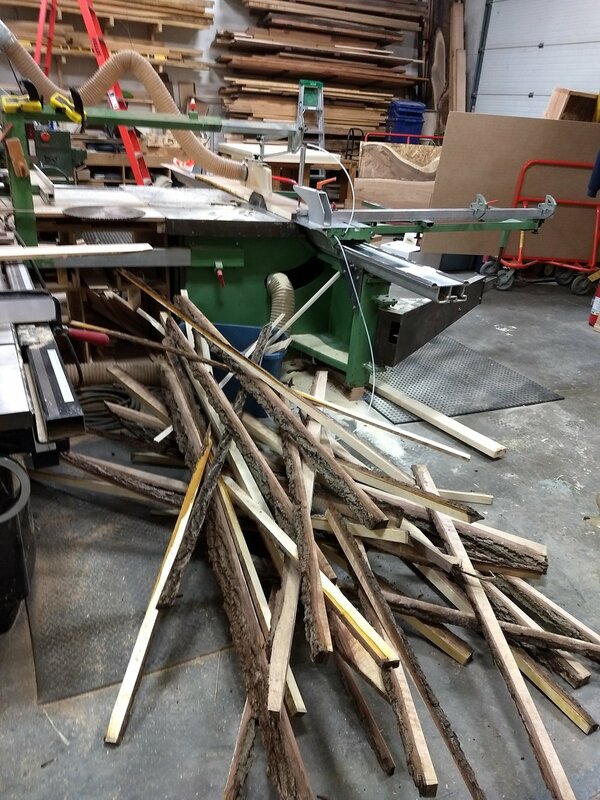 The first step in the shop was to "rip" cut the bark and a portion of the white sapwood. Only the inner heartwood has the rich dark chocolate color walnut is famous for. The end results is a pile of beautiful boards, some very interesting crotch slices and five totes of firewood. The lumber was stacked to dry with "sticker" spacers between the boards to allow air flow. In approximately a year it will be a lovely dining room table and other pieces of furniture.